The post-game player interviews are conducted at the bottom of a broad, dressing-room stairs under a solemn, impressionist-style portrait of the Queen. Her Majesty's expression is in tune with that of a woman who has just seen her grandson needlessly soaked by a neighbour's discourtesy. Pinned to the wall is a giant, chrome dragon, like some vulgar marionette long retired from active duty. As the players descend, the sound of their bags tobogganing behind them down the steps is like staccato gunfire. They settle one side of three metal barriers, journalists on the other in a lamely formal arrangement. On Saturday, the Irish players weren't of a mind to linger there, those on 'mixed-zone' duty coming and going long before most media people had made it down into the bowels of the stadium. Maybe that open roof outside had been the least important thing as Ireland chased Saturday's arithmetic, but it did call into colour the concept of self-harm. Because, as it rained an ocean in Cardiff, Ireland's haplessness brought to mind a circus trapeze artist, compelled to negotiate the high-wire having archly dismissed any need for a safety net. How, after all, do you chase a 16-point deficit when the storm is blowing so hard the ball-boys all but need to be anchored down with ropes? The sight of Alun Wyn Jones wrapping up Wales' shivering, seven-year-old mascot in the captain's training top during the preliminaries thus had an almost emblematic quality. Because, ultimately, Ireland's insistence that the roof remained open - knowing the storm now barrelling towards us - ended up looking hapless, even needlessly bad-mannered. Warren Gatland seemed to be conveying that very point afterwards, standing for the fireworks without any attempt at shelter for his now conspicuously soaked navy blazer. Prince William too was getting drenched until four black umbrellas eventually materialised by the Grand Slam presentation podium, life-vests tossed to the already drowned. The modern professional rugby player is now coached to speak like a PR brochure and, to a man, the Irish brought to the bottom of the stairs now summoned all the resiliently upbeat group-speak. Rob Kearney indicated that the matter of the roof was "a collective decision made by coaches and leaders of the team throughout the week." He did admit, mind, that the conditions had "a huge amount to do" with Ireland's prolific accumulation of errors. It was, as he put it, "a little bit breezy out there". We have been spoiled in the Joe Schmidt era by an Irish team that, for a time, became the most clinically efficient in world rugby. And that's what has been so joltingly surrendered in this Six Nations. The sense of calm certainty, of tactical coherence, of a group bound tight by one, unwavering philosophy. At the final whistle on Saturday, James Ryan just stood alone, staring into space. For maybe ten seconds, he was motionless until the Welsh captain, Jones, approached with a conciliatory hand. Ryan's first 23 games as a professional player did not produce a single defeat, but he's now been part of an Irish team on the wrong end of two thumpings in ten weeks. Faith becomes a papery concept when opponents inflict what England and Wales have on Schmidt's Ireland in this Championship. Worse than that, in a World Cup year, worry isn't slow to curdle into panic. Kearney admitted it was logical now to expect some kind of "backlash" for an underwhelming campaign. "I'm sure there will be" he acknowledged. "You know there was a huge backlash after the England game. There was even a little bit of a backlash after the Italian game, albeit we'd won with a bonus point. Didn't play particularly well but....you know I'm sure there'll be lots said about us as players and as a team over the coming weeks, but it's part of being professional athletes too. "We just have to come together, close rank a little bit and just never lose focus on just how good we are as players and as a team." 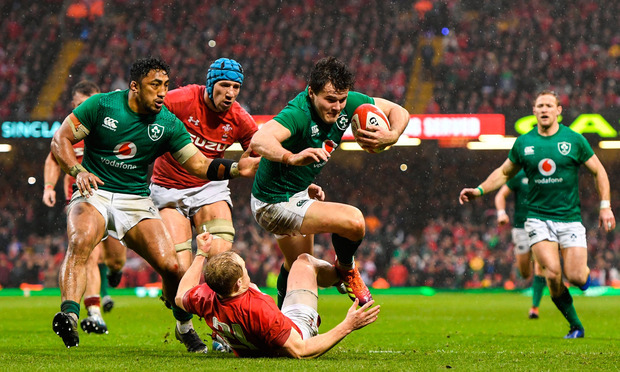 To do that, they will need to shut their ears to what seems a brewing consensus that Ireland's play might have become too prescriptive, too one-dimensional under Schmidt's baton to unsettle the big beasts of the game anymore. The central contract structure facilitates careful management of players' time on the pitch and maybe, accordingly, empowers a gameplan demanding extreme, unrelenting physicality. The style that won last year's Grand Slam placed huge purchase on rucking power and ferocity at the breakdown. But twice in this Six Nations Ireland have been bullied. Twice they've conceded a try in the opening seconds. Twice they've looked to be playing a game that the opposition had anticipated and, comfortably, outsmarted. Schmidt's view that Saturday's defeat didn't quite dip to the depths of the England one was difficult to reconcile with the evidence before us. From the off, control and discipline proved glaringly elusive. And there were slapstick moments. Like Conor Murray trying to nail Josh Adams with a tackle behind the Welsh line only to be flattened by Peter O'Mahony arriving on the same errand. Like CJ Stander trying to take a tap-penalty only to knock on. Like Jonathan Sexton kicking a restart dead after Gareth Anscombe's penalty made it 19-0 or throwing that fugitive pass to touch when Kearney seemed to run an independent line. Kearney talked of the small "margins" after and of how, despite that remarkable accumulation of wins in 2018, the players always understood the relatively threadbare plot-lines that some victories were built upon. "We've still a huge amount of confidence in how we are as a team" he stressed. "You know we just need to be realistic that there's a lot of other good teams out there too." He suggested that Ireland needed to "bank all these tough days" for future reference now, that the image of Welsh celebrations in the downpour would "live with all of us for a long time over the next few months." Schmidt can surely only hope that looming time with their provinces will prove restorative for his half-backs, Sexton and Murray, for whom this Six Nations has been resolutely underwhelming. But, more than that, he maybe needs to persuade his dressing-room that they are not, as Saturday evening's morbidity seemed to imply, a group in vivid crisis now. As Schmidt spoke at his post-match press conference, the sound of celebrations carried up from Wales' changing-room. "The team will definitely turn up in Japan" he promised. Words of defiant certainty after a performance that communicated none. Neil Francis When I was a nipper most of the crew I hung around with supported Manchester United and things were peachy until the 1973/'74 season when United, under Tommy Docherty, were relegated. Sinéad Kissane A line from the 1995 movie 'Heat' came to mind when a TV camera focused on Joe Schmidt near the end of last Saturday's game in Cardiff.